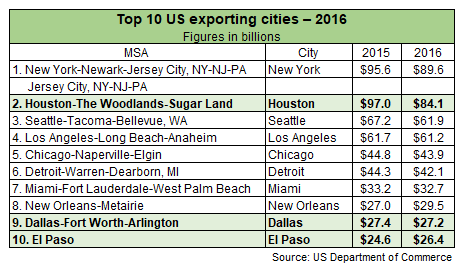 ​​ ​EL PASO – Texas' largest border city has moved up one notch to the nation's tenth largest exporter out of 388 metropolitan areas, according to the latest figures from the U.S. Department of Commerce. That puts the city just below Dallas and just ahead of San Francisco. The latest totals of export trade for 2016 show $26.5 billion worth of goods moved through El Paso, 84 percent of which was bound for Mexico. That's a 162 percent increase since 2006 and means the city accounted for 13 percent of all the goods exported from Texas. “Eight years ago, El Paso was 26th in the nation, so this has been a steady and strong trend," said Robert Queen, the director of the U.S. Commerce Department's Export Assistance Center in El Paso. Check out Industrial Market Research for the El Paso region.